1 Blemished Available: $89.99 This item is available as a Blem/Refurb. These are items that cannot be sold as "New" merchandise and are limited to stock on hand. See the product details for a description of the product's condition. 1 Blemished Available: $79.99 This item is available as a Blem/Refurb. These are items that cannot be sold as "New" merchandise and are limited to stock on hand. See the product details for a description of the product's condition. The Street and Steel Oakland Helmet oozes West Coast cool. A shorty-style lid with low profile visor and drop down inner sun shield, the Street & Steel Oakland Helmet has everything you need, and nothing that you don't. Note: Retractable Sun Visor may interfere with glasses. Can you wear glasses under the retractable sun visor? Can I order a clear visor? 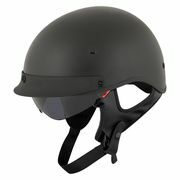 Is the street and steel Oakland helmet a round or intermediate oval shape? Where's the size chart for this helmet? ?